While last January saw the largest increase in real estate sales for the Highlands/Cashiers area, February showed no increase, nor did it show a decline. The two months combined still show a 31.25% increase in the total number of homes sold compared to average of previous years. While it’s still too early to tell what 2018 holds in store for real estate, the overall market view is promising. So February showed no increase. What does that mean? As in all markets, one should not get alarmed by any single report. Recent NYSE reports put many in a tail spin. Reporters mention the largest single drop in recorded history. Overreaction caused some to panic. The next day the market had a huge recovery. Then down again, and so on. The media likes to dramatize many events. Take the weatherman for example. OK, maybe that was stretching it, but you get the point. The first thing you will notice is that, overall, there is a marked increase. Yes, the market fell off in 2008-2009. Now, Dow Jones may not be the best indicator. You may like to look at NASDAQ.com. You can look at a 10 year chart here and you will see the same thing. Markets come and go, but overall there is an increase. It’s the long haul that matters. 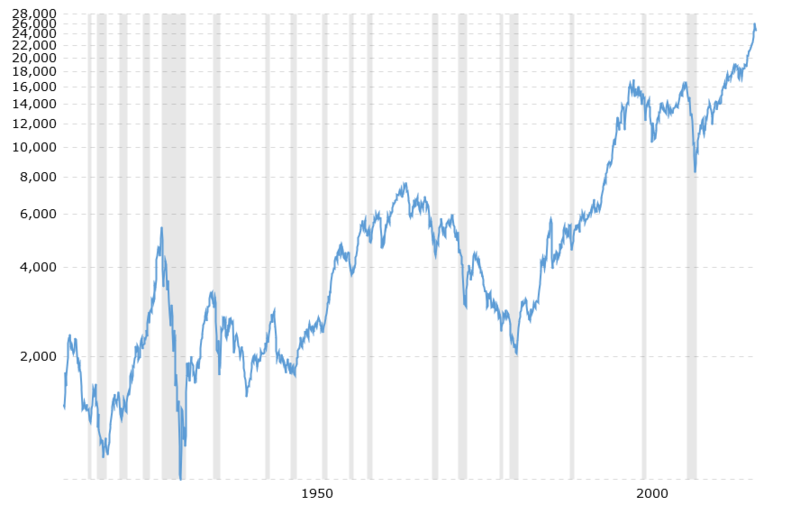 This can raise questions such as, when do you get in; During a decline, at the bottom, on the rise or at the top? Then, how long does any of that last? With an increase in demand for homes in many places around the country, home prices have been on the increase. One recent report mentioned affordability as a current issue. This is in areas that have high demand and little supply. Unfortunately, in Highlands and Cashiers area, there is plenty of supply. For example, although January had a huge increase in home sales, there were more homes that came on the market (63) than were sold (51). 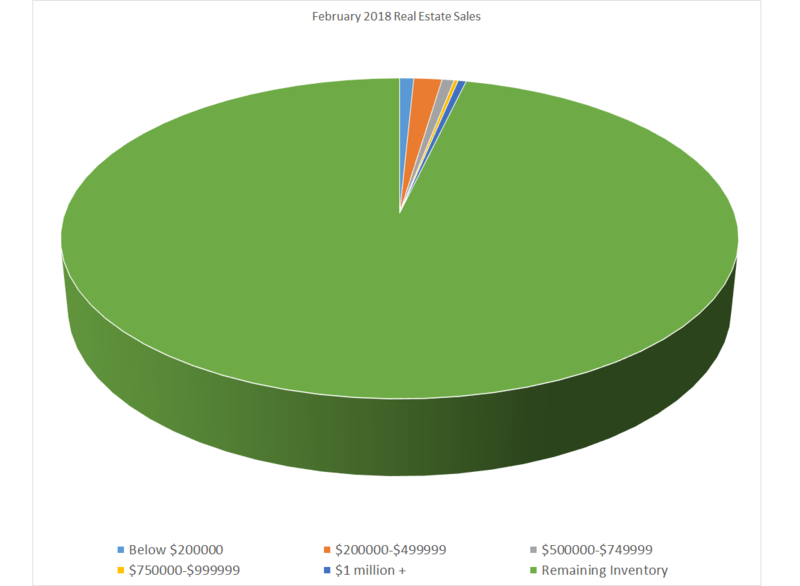 February sold 33 homes while there were 66 new listings. As we come into our “season” more homes will continue to come on the market. On average, the Highlands/Cashiers MLS has about 1100 homes on the market. The average number of units sold is currently at 58. This means we currently have about 18 months worth of inventory on the market. Healthy markets are considered to be around 6 months of inventory. In the following chart, You see the total inventory represented by the entire circle. What sold and the price ranges are the small colored wedges. The huge green area is the amount of inventory left to sell. As you will notice, there is a large inventory in comparison with the number of sales. So there you have it. With current inventory, prices are just not expected to climb. Although home sales are increasing, prices are expected to continue to be held at bay. A few exceptions can be lakefront properties. Also, properties that are closer to town or have other amenities are more desirable than more rural properties. The majority of home buyers want to be close to town. Total homes listed in Highlands/Cashiers MLS: 862 This number should begin to rise over the next few months as many homeowners will try to take advantage of the “busy” selling season. A rise in inventory means more homes on the market. 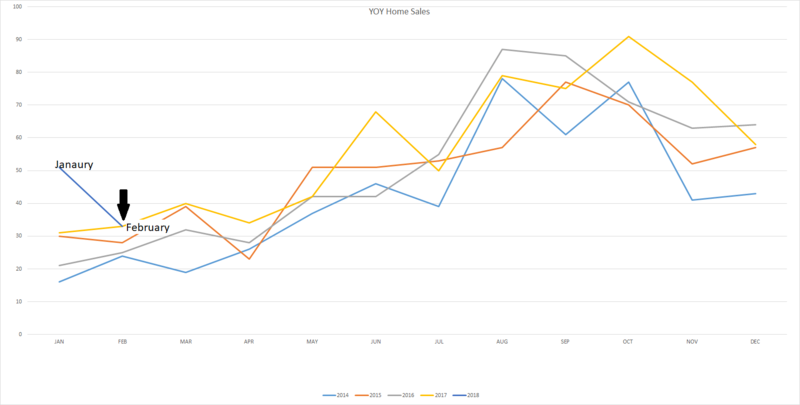 Homes Sold This Month: 33 While sales did drop from January to February, February held steady with previous years. 2018 is off to a good start. Average Unit Sales per Month/1 Year Average: 58 – This number is holding steady since there was no change in February. These were some of the homes sold that had those 3-8 years on the market. This shows the importance of pricing. There are too many homes to choose from in any price range. Buyers will simply choose the best value. Homes that are priced to high to begin with are seldom viewed and then become “stigmatized” by brokers as being too high. Good brokers will not take their Buyer Clients to homes that are overpriced. It’s considered a waste of time for all concerned. Median Sales Price: $273,000 . This is the first drop below $300,000 in several months. This is not the average sales price, but rather the middle of the market. Average List/Sell Ratio: 90.09% – In an attempt to please many Sellers, Brokers will list a home for more than its Fair Market Price. This really only hurts the Seller. After some time of no activity, Brokers will typically help Sellers to see the need to lower the price. Little to no activity on a listing is a good indicator you may be priced out of the market. Synopsis: While this market seems to hold some promise of better times ahead, homes are still considered to be overpriced. Sellers need a Broker that is forthcoming, without a lot of sales hype to “win” the listing. Inventory: 92 months (7+ years). This is a huge inventory. With little change in land sales, land prices will continue to be held low. 6% of home sales ranged from $750,000 – $1,000,000. The winners for February were those from $500,000 – $749,999. More homes were sold in this narrow price range. Homes from $200,000 – $499,999 take up 4 different price ranges. BUYERS: The question posed at the beginning was, “when do you get in?” As the market continues to show increase in this area, it may be best to take advantage of the high inventory. This is what is keeping prices down, currently. However, as inventory is starting to show some decline, this would indicate a stronger market may be in the not to distant future. SELLERS: While positive signs are emerging, it may be premature to think you may get more out of your home now. Recent sales, mentioned above, show that pricing high just to expect more is not in your best interest. Buyers simply won’t spend more just because a Seller “feels” his house is worth more. CONCLUSION: There is a change in the climate, and we’re not just talking about the weather here. There are positive signs for real estate in Highlands and Cashiers. The best strategy is to price it right from the beginning. This way, Sellers will beat out their competition that are already priced to high. Buyers will often hesitate if they feel they have to negotiate to far. They will find something they need to negotiate on very little, feeling comfortable that a Seller will accept their offer. While it’s too early to tell to much for this new year, there are enough indicators for one to take action.